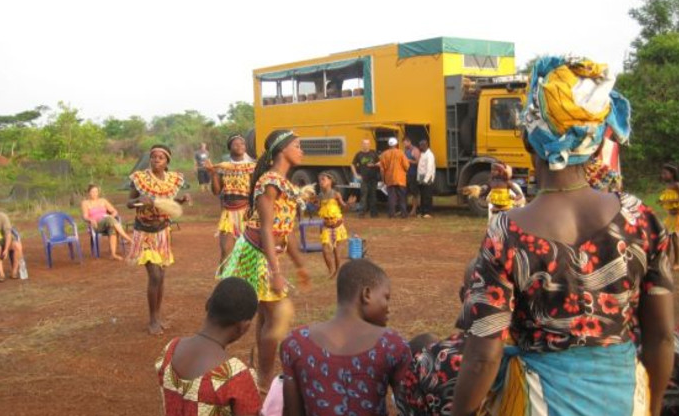 My travels, or wanderings, have begun in Africa with a stint volunteering in Kwahu Asaka, Eastern Province in Ghana. To say that Africa has captured my heart would be an understatement. As one of my favourite travel authors and overland legend, Paul Theroux says in The Last Train to Zona Verde, ‘Happy again, back in the kingdom of light’. I couldn’t have put it better! So this volunteer intends to wander all over this beautiful beast of a continent, to soak up more of its culture and meet as many of its infectiously joyous and wonderful inhabitants as possible. My original plan was to head directly to Tanzania, after Ghana, for my next volunteering assignment. I contemplated how best to get from west to east and in full ‘take me away from my comfort zone’ mode I was looking for an overland route to take me from Ghana to Tanzania. Initially I thought lets draw a line between the two and then travel it….. I then spoke to a friend who works for the African Union in London and she said ‘the big problem is the Central African Republic, even in Africa, to African’s, well they actually wonder whether the country exists at all’. Apparently it’s lawless and largely invisible to the rest of Africa, as it doesn’t participate in AU stuff. “Oh, Right.” I said as I scratched my head. She added, ‘Jack, that’s not all…. IF you even ATTEMPT to make this journey then I shall come around and shoot you.” This is what they call putting the frighteners on, and do you know what? It worked!! 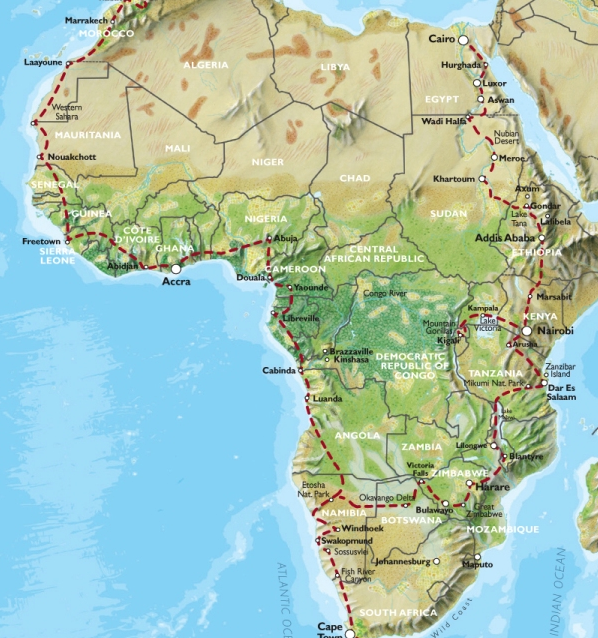 I looked even harder on the interwebby and came across an old, old article (2005) by my favourite travel journalist, Simon Calder, about travelling through Africa and this led me to the trip you see mapped out here. It’s organised and run by Oasis Overland who’ve run these kinda trips on various continents for years. I spoke to the delightful Kristy at Oasis and looked at joining for two stages of the trans from Accra to Cape Town then Cape Town to Nairobi, with the thought that I’d jump off early at Dar. That way I could hook up with my Tanzanian volunteering. I then thought NO, firstly this overland thingy takes you too far out of your way and secondly it delays your next volunteering gig. The trouble with my resistance was it wasn’t real, I just couldn’t get this trip out of my mind, it seemed exciting and adventurous. It would take me to African heartlands away from tourist trails. Heck it would even take me to Angola and who goes there? My resistance became futile when I discovered I could volunteer as part of the trip. So a few days later I found myself booking the trip and at the last moment I decided not to stop at Dar, or even Nairobi, but to go all the way to Cairo. After all I just couldn’t miss out on seeing the famous sunken rock hewn churches in Lalibela, Ethiopia. To say Im excited would be the biggest understatement of my life. Twenty nine weeks of rough camping under African skies. Twenty one countries to immerse myself in. WOWSER!! The truck that we travel on takes up to 24 of us, though the 24 will change as we transition from each one of the four stages to the next, with people leaving and others joining. Ive been fortunate in that I met a few of my travel companions in London, last summer and as I also decided to create a Facebook group, to act as a forum for all of us to exchange info, etc, Ive been able to have conversations with almost everyone who’s going to be on the trip. We come from far and wide; a contingent of Brits, a few of our Antipodean cousins, fellow Europeans, Asians and Americans. I think we are all about to have the time of our lives! That sounds so exciting! I did an overland trip with Acacia Africa from Nairobi to Cape Town and it was absolutely amazing. Would have loved to have done even more places though (21 countries – wow!). You will have a fantastic time! Yes. I’m a tad excited [insert boy squeal here – rich baritone voice obvs]! Haha total boy squeal! Thank you 🙂 Let me know if you need any advice on anything. Africa is my true love (don’t tell my husband I said that lol)!